Gilmour had an incredibly powerful morning on campus on Wednesday, October 24. 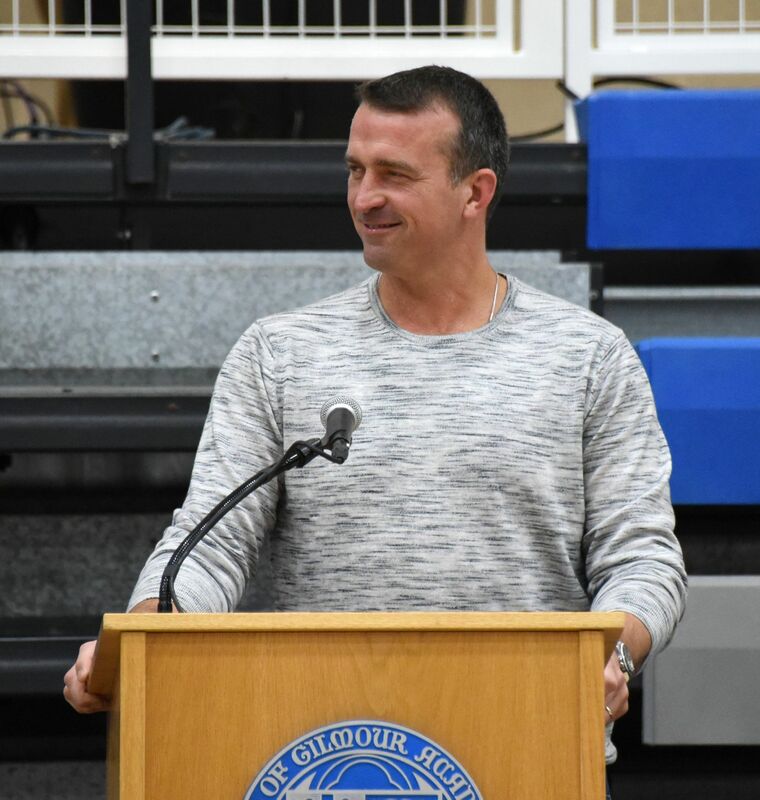 Thanks to the generosity of the Pender family and their “Educating the Heart: A Moral Compass” speaker series in memory of their son Michael Pender ’90, we were able to welcome Chris Herren to speak to students in Grades 7-12, parents, alumni and guests. Chris Herren is a former college and NBA basketball star whose career was ruined by his addiction to drugs and alcohol. His story is the subject of his memoir, “Basketball Junkie,” as well as the Emmy-nominated ESPN Films documentary “Unguarded.” Both chronicle his rise and subsequent fall from legendary high school basketball player to drug-addicted college and NBA player. Alcohol and drug-free since August 1, 2008, Chris has refocused his life to put his sobriety and family above all else. In June of 2009, he launched Hoop Dreams with Chris Herren to share his story with audiences in the hopes of reaching just one person and making a difference in his or her life. 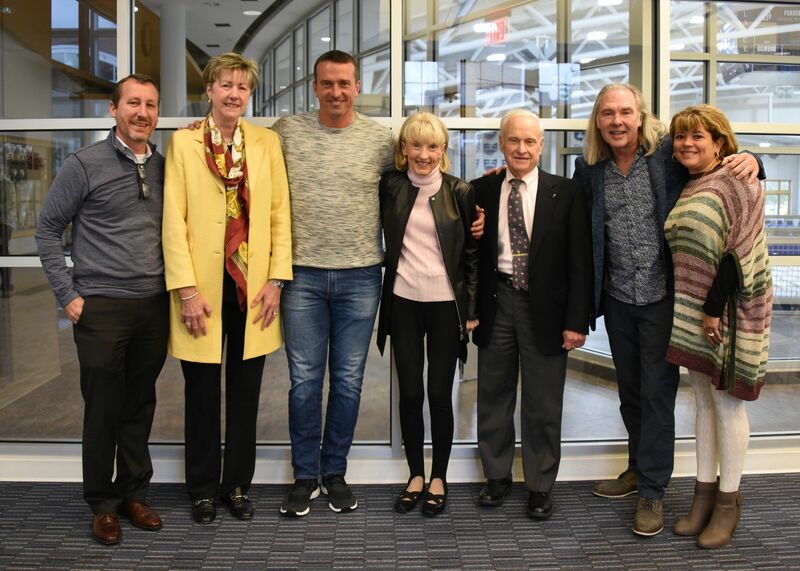 The Pender family brought Chris Herren to campus in 2013 and, more than five years later, his message continued to resonate with those of us on campus who heard him the first time. In today’s day and age, when not a day goes by that we don’t hear about another teen or another family affected by the opioid crisis, we agreed that it was important to bring Chris back to speak to this new group of Gilmour students. His message was raw, honest and incredibly impactful. He talked openly about his worst days as a drug addict, but stressed that it is more important to look at his first days as a user, when he was “just” experimenting with Miller Lites and marijuana. He stressed that his group of 15 buddies who, as freshmen, drank together in the woods and in each other’s basements, never pictured themselves shooting up heroin just a few years later. But, in reality, of those 15 buddies, seven became heroin addicts. He talked about sitting through drug presentations in high school and never thinking they were meant for him because he “just” drank and smoked a little. But, his substance abuse quickly progressed to cocaine, oxycontin and then heroin. He urged the students to “ask themselves the why.” Why suddenly at 15 do they need to drink in order to hang out with kids they’ve known since they were five? Why do they work so hard all week in the classroom and on the athletic fields, yet throw that away on the weekends? He believes the key to avoiding the clutches of substance abuse is answering the “why” and addressing it. After his talk, Chris opened the floor for a Q&A session. Our students asked terrific questions. When the presentation ended, he made himself available for those who wanted to talk to him one-on-one. Both during his presentation and in the conversations after, Chris reminded students of the number of adults at Gilmour – teachers, counselors, coaches, advisors – who are here to help. He urged students to reach out if they are struggling and also provided them with his contact info - theherrenproject.org/student-resources. He has a team of trained social workers and counselors working with him to manage the volume of communication he receives. Our community was so blessed to hear Chris’ powerful message and we hope it will resonate with students as they navigate their high school years and have to make difficult decisions in the face of peer pressure. Thank you to the Pender family for this incredible opportunity to truly educate the hearts of our students.